Authorities say an MMA fighter suspected of killing two people, including an ex-girlfriend, has been captured after escaping from a prisoner transport van in Texas. Montgomery County sheriff's Lt. Scott Spencer tweeted Sunday evening that Cedric Marks was taken into custody after a nine-hour manhunt involving multiple law enforcement agencies. Police said earlier that Marks escaped Sunday morning from the private prison transport van during a stop at a McDonald's in Conroe, about 40 miles (65 kilometers) north of Houston. Murder warrants were issued Sunday for Marks in last month's killings of an ex-girlfriend, Jenna Scott, and a friend of hers, Michael Swearingin, who disappeared Jan. 4 and were found on Jan. 15 buried in a shallow grave in Clearview, Oklahoma. This update has been corrected to show that Spencer is with the Montgomery County Sheriff's Office, not Conroe police. Authorities in Texas say two murder warrants have been issued for an MMA fighter who escaped from a private prisoner transport. Conroe police Lt. Dorcy McGinnis said at a news conference that 44-year-old Cedric Marks escaped from the private prisoner transport van Sunday when it stopped at a McDonald's in Conroe, about 40 miles (65 kilometers) north of Houston. She says Marks is extremely dangerous. McGinnis says murder warrants were issued for Marks on Sunday in the deaths of an ex-girlfriend, Jenna Scott, and her friend, Michael Swearingin. The two disappeared Jan. 4 and were found buried in a shallow grave in Clearview, Oklahoma, on Jan. 15. Marks was arrested in Michigan last month on a charge alleging he broke into Scott's home in Temple, Texas, in August. He was being extradited to Bell County to face that charge when he escaped. Police in Bloomington, Minnesota, say Marks remains a person of interest in the 2009 disappearance of April Pease, with whom he had a child. The Washington state woman had accused him of domestic violence. Authorities in Texas say an MMA fighter facing three "pending murder charges" has escaped from a private prisoner transport. The Montgomery County Sheriff's Office tweeted Sunday that Cedric Marks escaped in Conroe, about 40 miles (65 kilometers) north of Houston, and is considered "extremely dangerous." 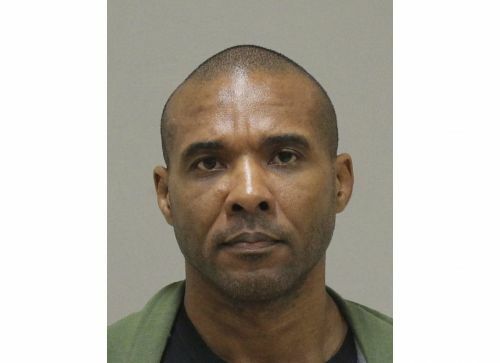 TV station KCEN reported that Marks was arrested in Michigan last month on a charge alleging he broke into the Temple, Texas, home of an ex-girlfriend, Jenna Scott, on Aug. 21. Scott and a friend, Michael Swearingin, disappeared Jan. 4 and were found buried in a shallow grave in Clearview, Oklahoma, on Jan. 15. Marks had not been named a suspect in their deaths.